Since the Stanley Cup playoffs began, shuttling back and forth several times between the Blues and their AHL affiliate, the Chicago Wolves was the norm for Jordan Schmaltz. The alarm was set for 5:30 a.m. in order to make it on time for a 7 a.m. flight from Chicago to St. Louis. The early-morning trip got Jordan Schmaltz to the rink on time for practice with the St. Louis Blues on Thursday. This has been his hectic life since the Stanley Cup playoffs began, shuttling back and forth several times between the Blues and their AHL affiliate, the Chicago Wolves. “I’m getting used to it,” Schmaltz said, preparing for the possibility that he will suit up for Game 5 of the Blues second-round series against the Nashville Predators on Friday. The Predators lead the series 3-1. “The first week was tough,” Schmaltz added. In the first week, Schmaltz played in the first-round series opener against the Minnesota Wild, a dramatic affair that the Blues won 2-1 in overtime. After Game 4, a 2-0 win for the Wild to make the series 3-1 for St. Louis, Schmaltz joined his AHL teammates for their series opener in Charlotte against the Checkers. 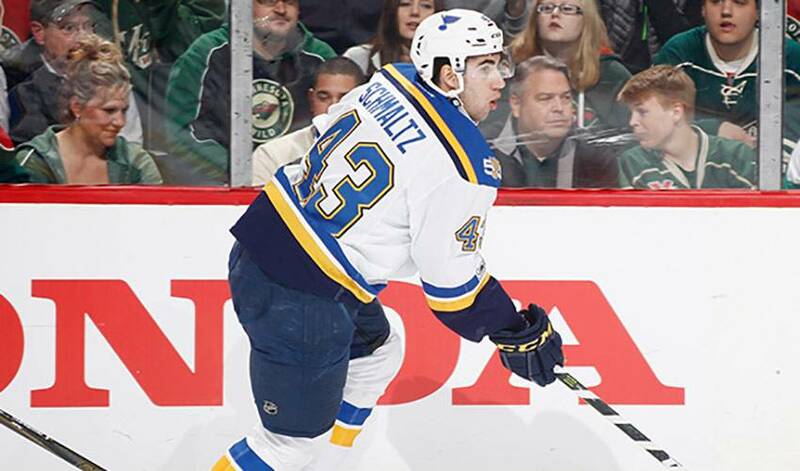 After a 4-0 loss in Charlotte, Schmaltz hopped on a plane to join the Blues for Game 5 in Minnesota. The Blues finished off the Wild and after the clinching game Schmaltz rejoined the Wolves, who won their best-of-five series with back-to-back victories in the final two games to take the series 3-2. Amazingly, there have no horrific travel stories, not even a flight delay. “It has been smooth sailing,” Schmaltz said. He was promoted to the Blues second-round series against the Predators. He remained with the team until the Wolves began their second-round series against the Grand Rapids Griffins on Wednesday. But following the Wolves 4-1 loss in the series opener, he prepared to leave for St. Louis once again. Schmaltz was asked for his thoughts on the difference between the Stanley Cup playoffs and the Calder Cup postseason in the AHL. That’s saying something, considering that Jordan watched his brother Nick, a forward, earlier this season with the Chicago Blackhawks at the United Center, one of the loudest buildings in the hockey world. Jordan saw his younger brother play a few times up-front-and-personal this season and then the two would go out for dinner to catch up. Jordan, 23, was born 28 months ahead of his younger brother. They played junior together for the USHL Green Bay Gamblers in 2011-12 and two more seasons at the University of North Dakota. Last year, Jordan turned pro. Nick and UND went on to win the NCAA Frozen Four championship. Nick turned pro last summer and made his NHL debut with the Blackhawks before his older brother. Nick played 61 games in the NHL and 16 in the AHL with the Rockford IceDogs, while Jordan was promoted late in the season to play nine games with the Blues. The Schmaltz brothers went up against each other twice this season in a three-week period in December and January. The IceDogs won both outings. “It was a lot of fun,” Nick Schmaltz said. “We were so competitive when we were younger, even though we played on the same teams. When we went up against each other in practice we turned up the intensity. There was a possibility the Blues and Blackhawks could meet in the playoffs. But surprisingly, the Blackhawks were swept in the first round by the Predators. Now, Nick is in Paris, where he will begin the 2017 IIHF World Hockey Championship with the United States on Friday. Jordan will continue his postseason journey with the Blues and Wolves.